I came across a fallen hornbeam tree one day while teaching my Sea Cadets some map reading. 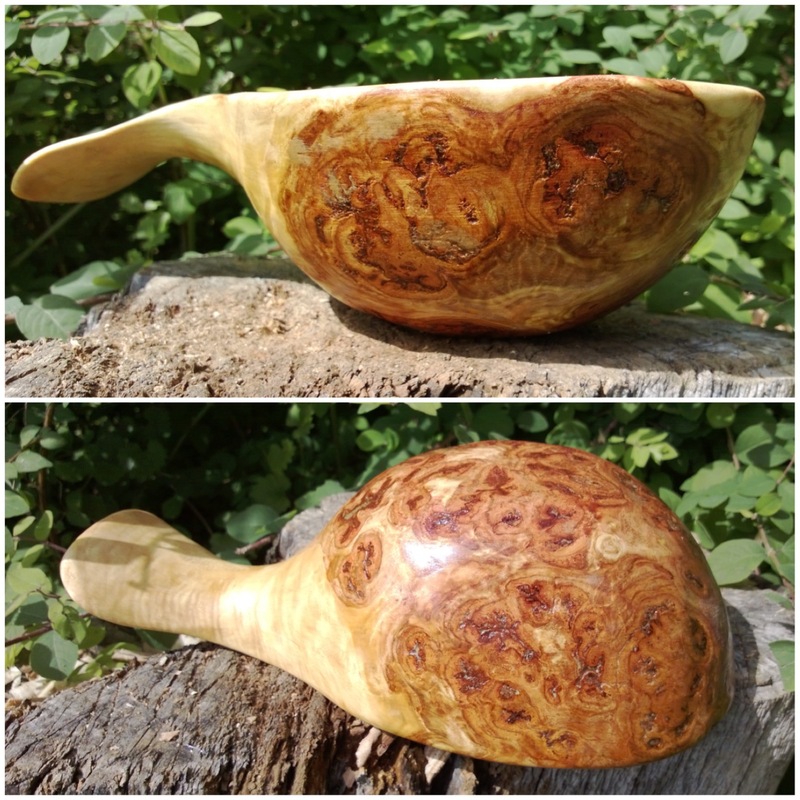 Attached to it was a burl that produced this beautifully swirled kuksa cup. 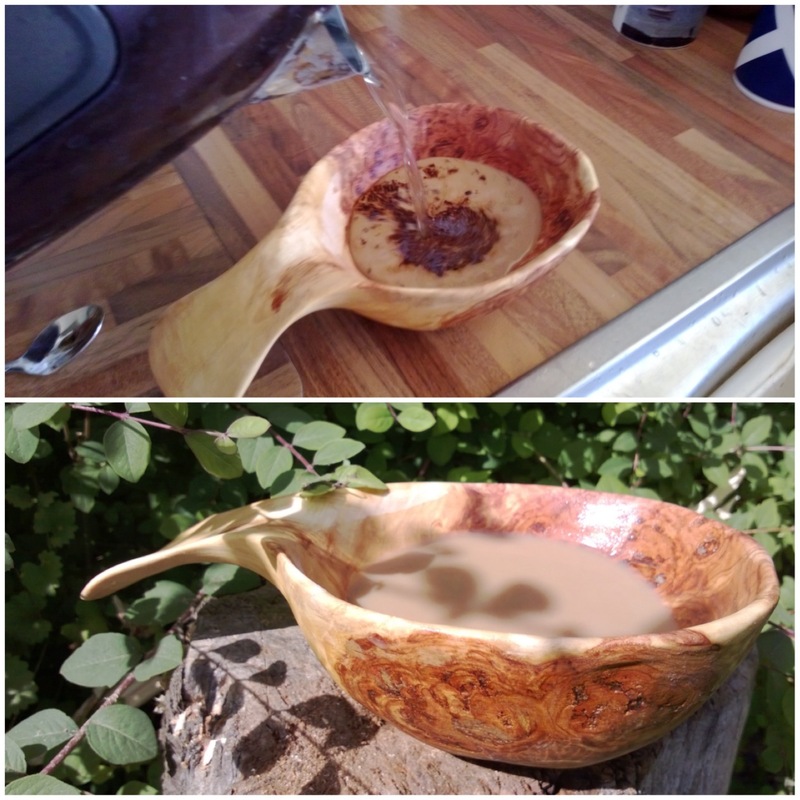 Before I could drink out of my new kuksa I had to sort the small matter of carving it. 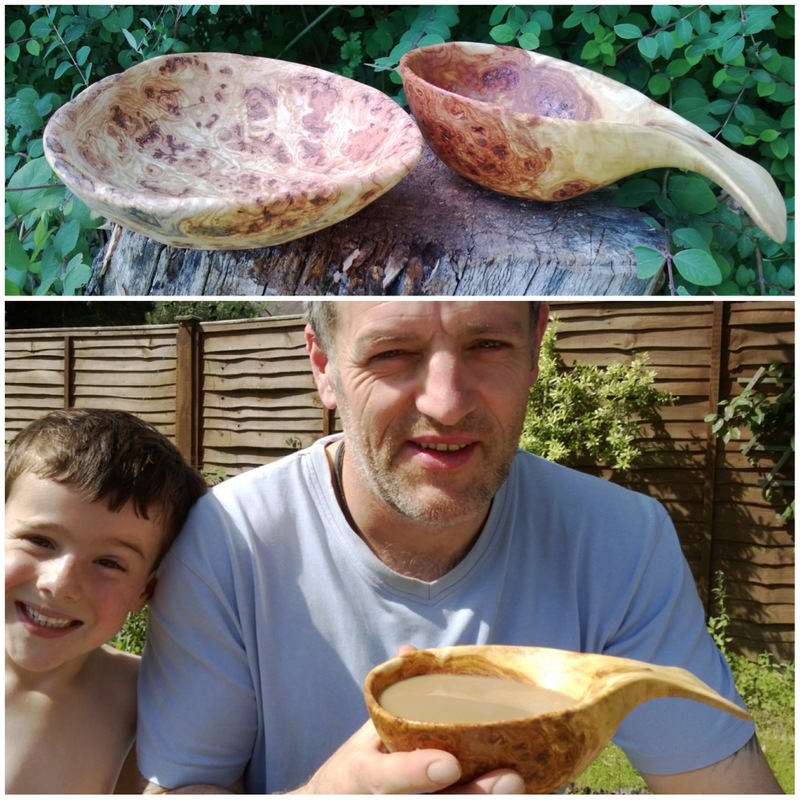 As I explained in my previous How To… on Carving a Small Noggin cup the name kuksa (also known as kåsa in Sweden) is probably not the correct term for the cup as it was not carved in a Scandinavian country by the Sami peoples. 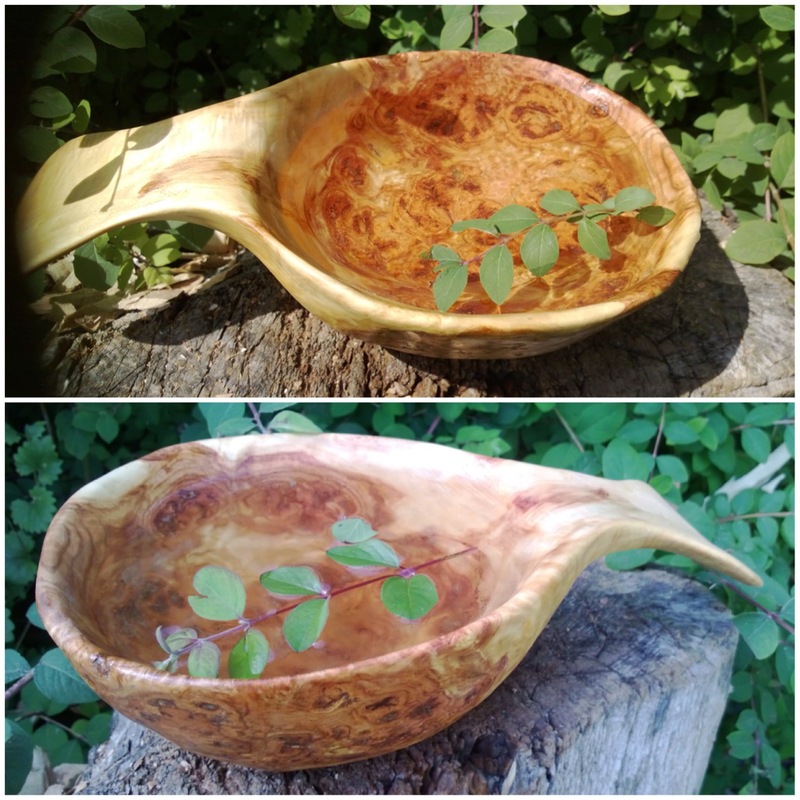 Also it was not carved out of a birch burl but I like the word kuksa and it was carved out of a hornbeam burl at least. 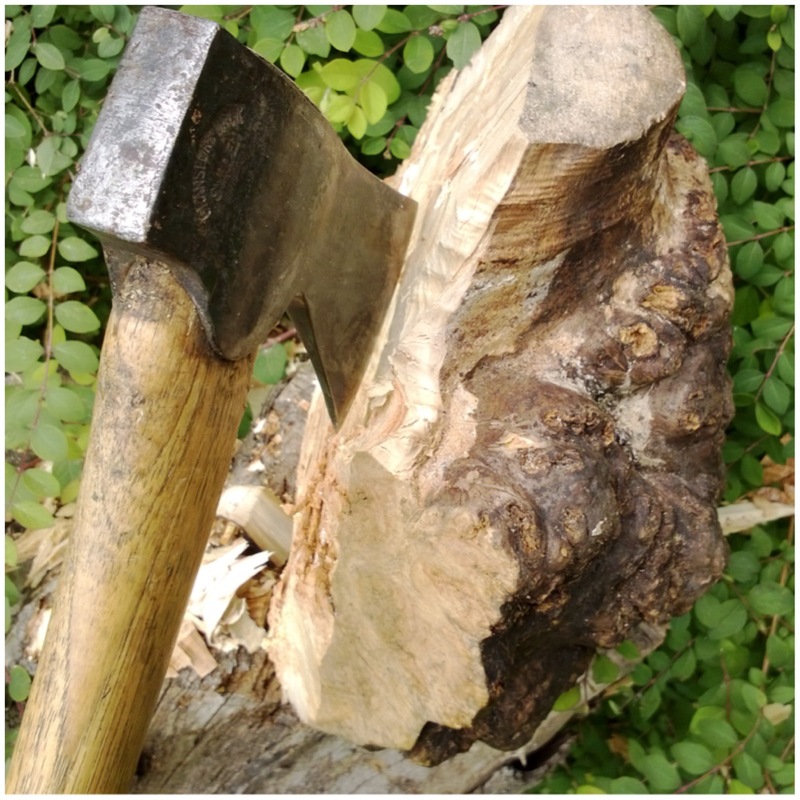 After cutting the burl section from the fallen tree I left it to season for 3 years in a cold but dry area (my garage). 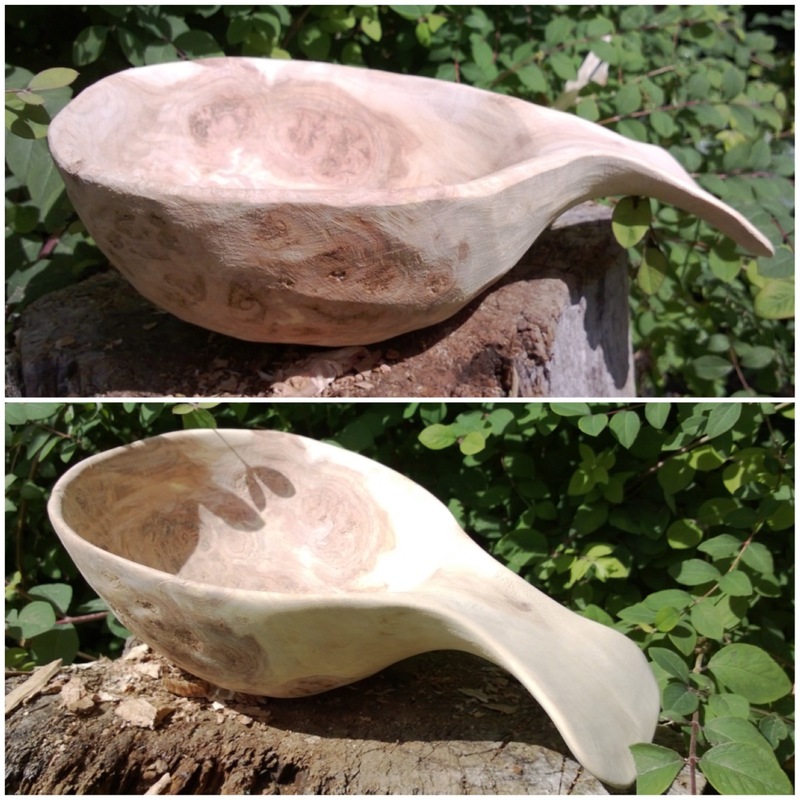 I wanted to create a kuksa that had the swirl of the burl wood and the clean lines of the heart wood. 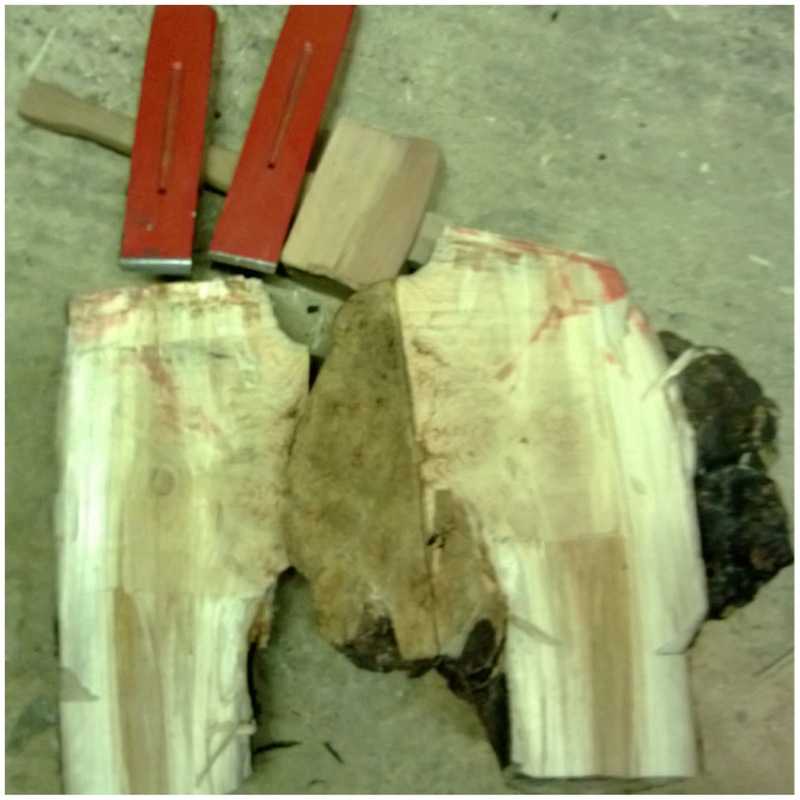 I started trying to saw down the length of the heartwood but that proved too difficult for my hand saw. 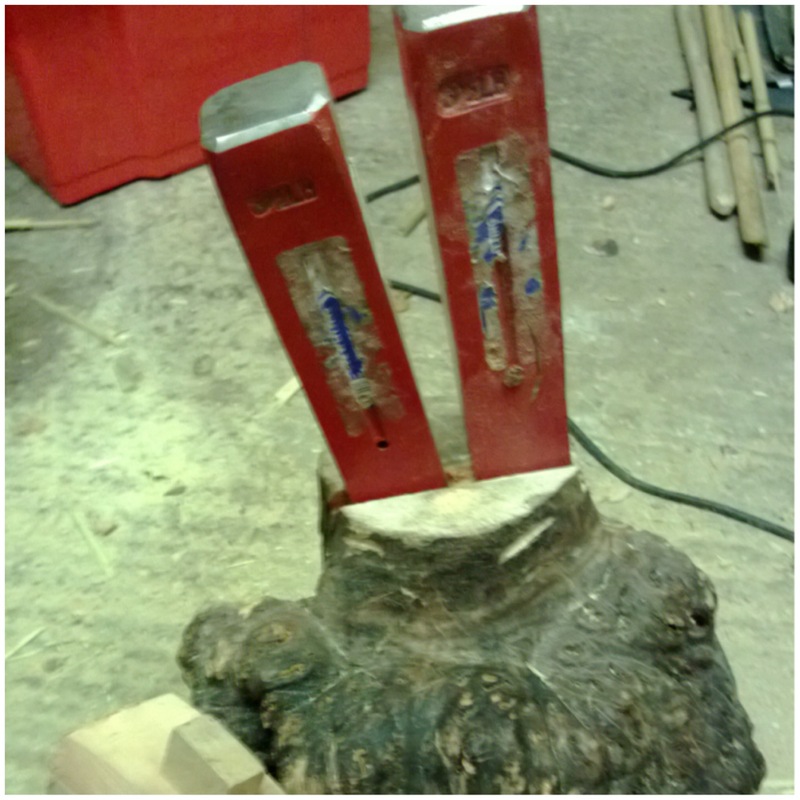 In the end I inserted two of my log splitting wedges into the saw cut and hammered down on them with a wooden mallet. Thankfully they split cleanly leaving me a fairly smooth surface to start axing out the shape of the kuksa. The heartwood was well seasoned and required quite a bit of axe work to get it down to the level I wanted. 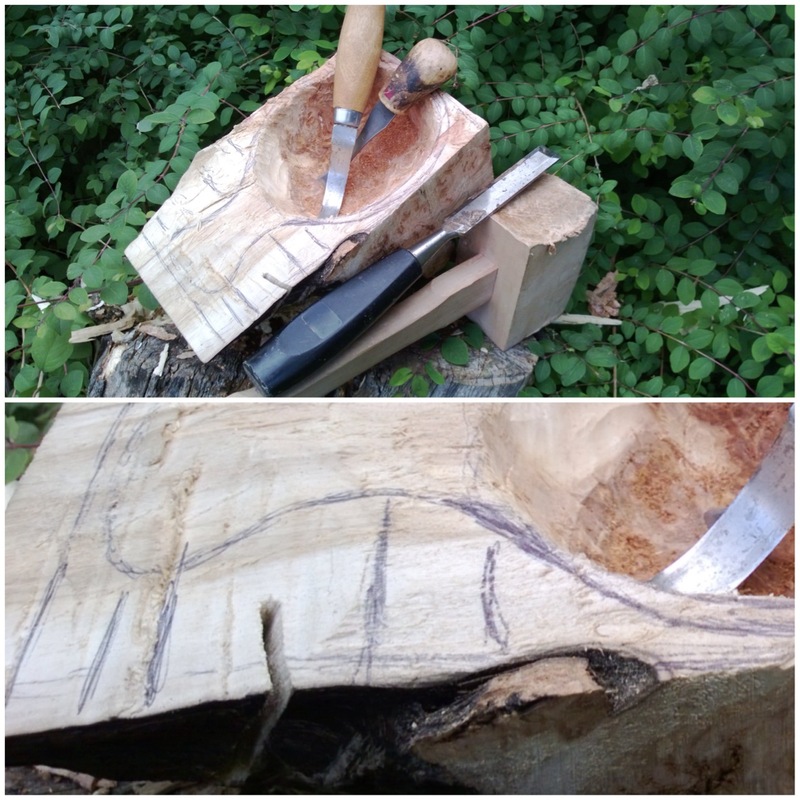 I stopped axing out the top of the kuksa when I started to reach the burl wood but kept the heartwood for the handle. I was inspired by Jon Mac with his kuksa handle in the style of an otter’s tail and felt that the heartwood would prove a stronger option to the burl wood. 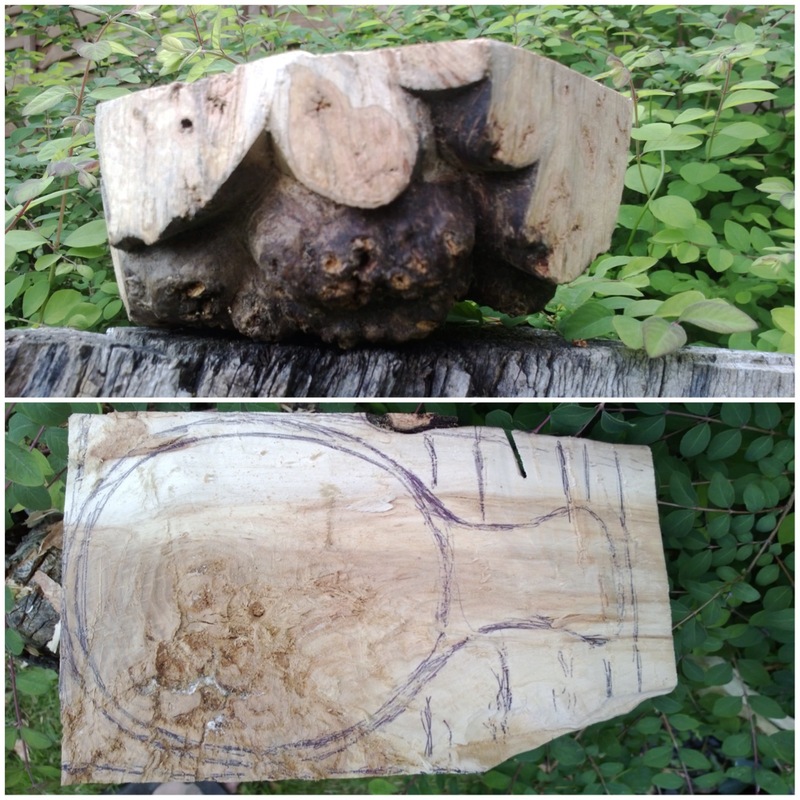 I drew out my general shape and used my saw again to cut off the excess on the sides. 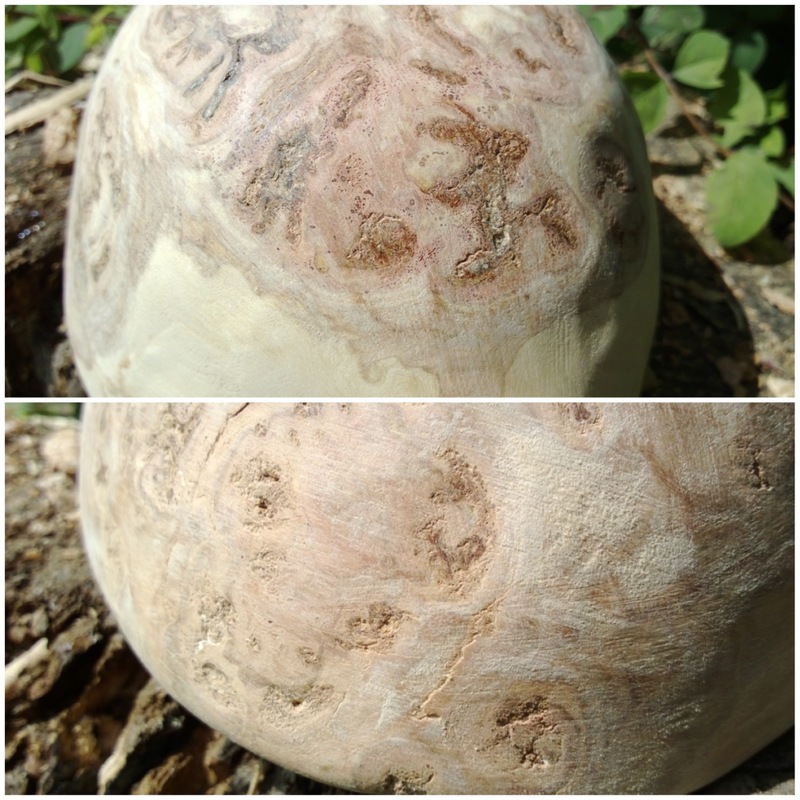 All the excess burl was carved later into either a quaich or a bowl. 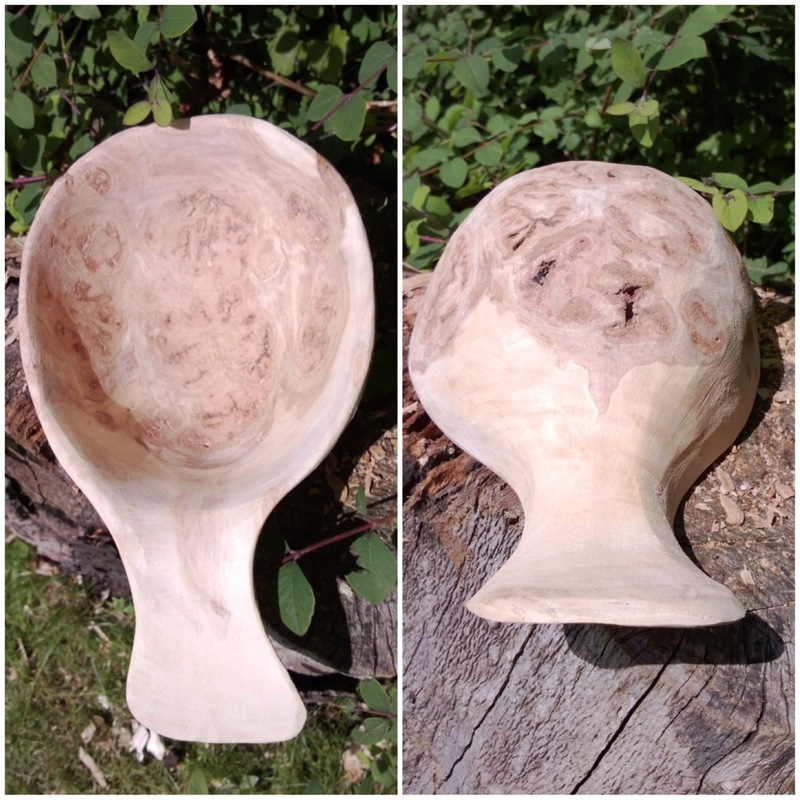 The burl was of a very good depth and even though there were some deep fissures I knew for once I would get a decent sized cup out of it. I did not take any pictures of me carving the bowl or shaping the kuksa as I was too busy carving and there was no one around to photograph for me. 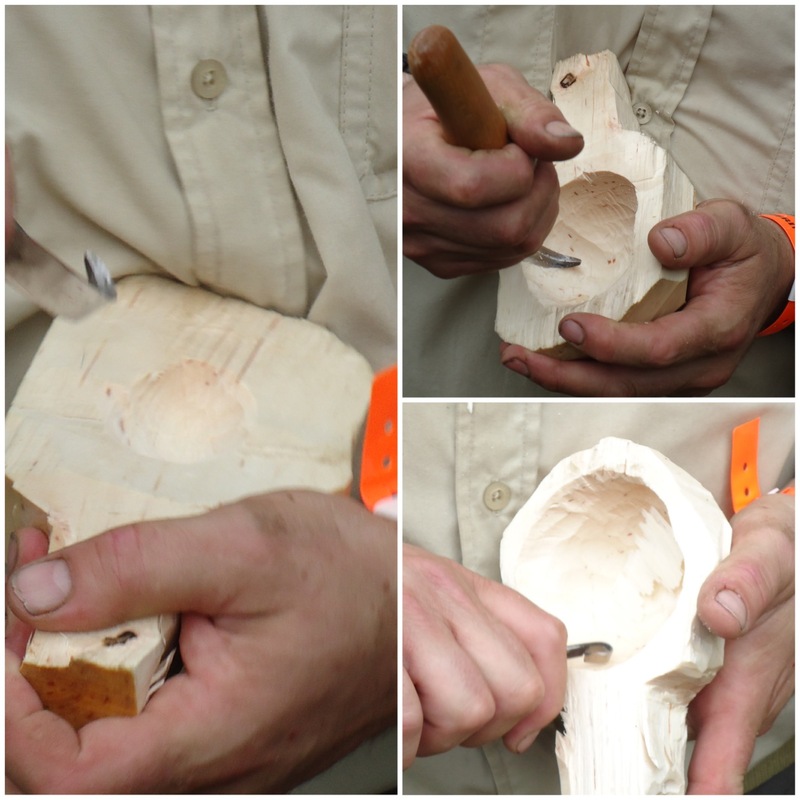 I looked in my archive though and came across these pictures of the master craftsman John Arthur from the Woodlife Makers Guild at the 2011 Wilderness Gathering demonstrating how to quickly blank out a kuksa. 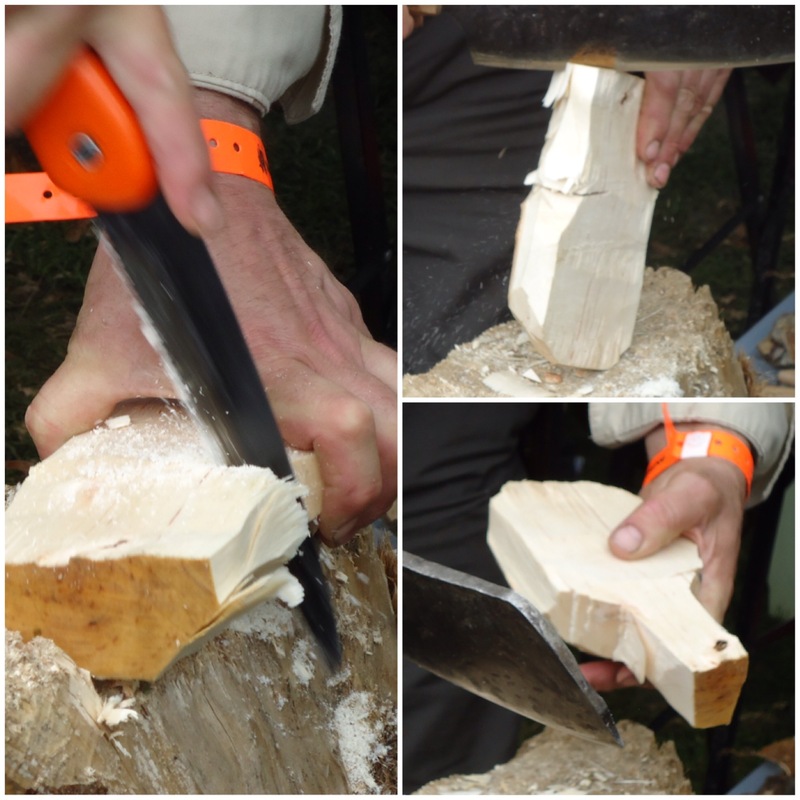 After chopping out the basic shape, John used a saw to put some stop cuts in. Stop cuts allow you to remove wood from specific areas without any split running off into wood you want to keep (in this case the area that will become the bowl). 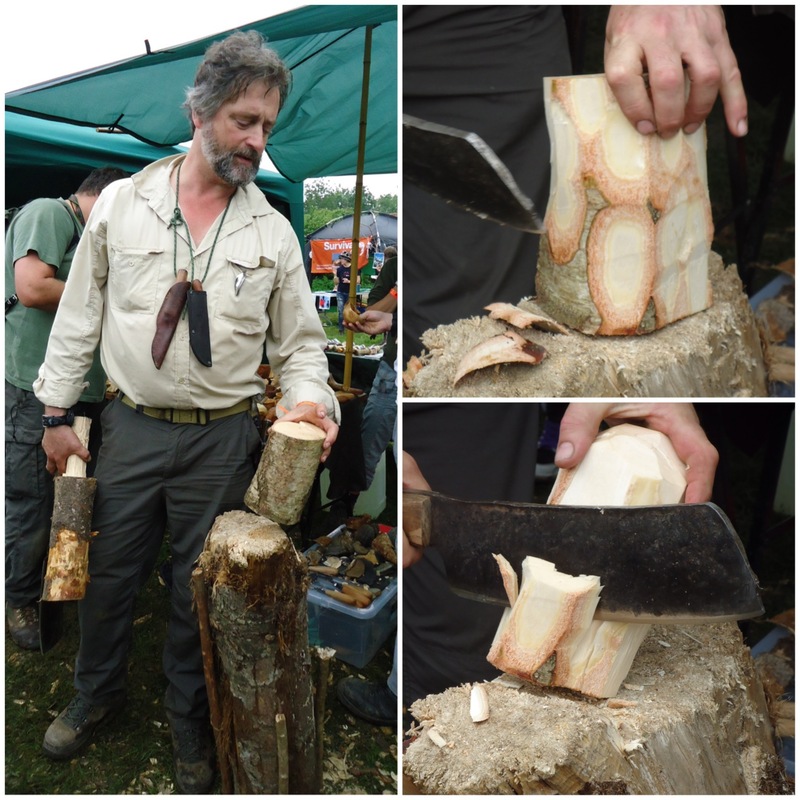 Once John had the basic shape he used his crook knife to carve out the bowl. He kept the knife in his right hand and continually turned the kuksa to carve out the bowl. 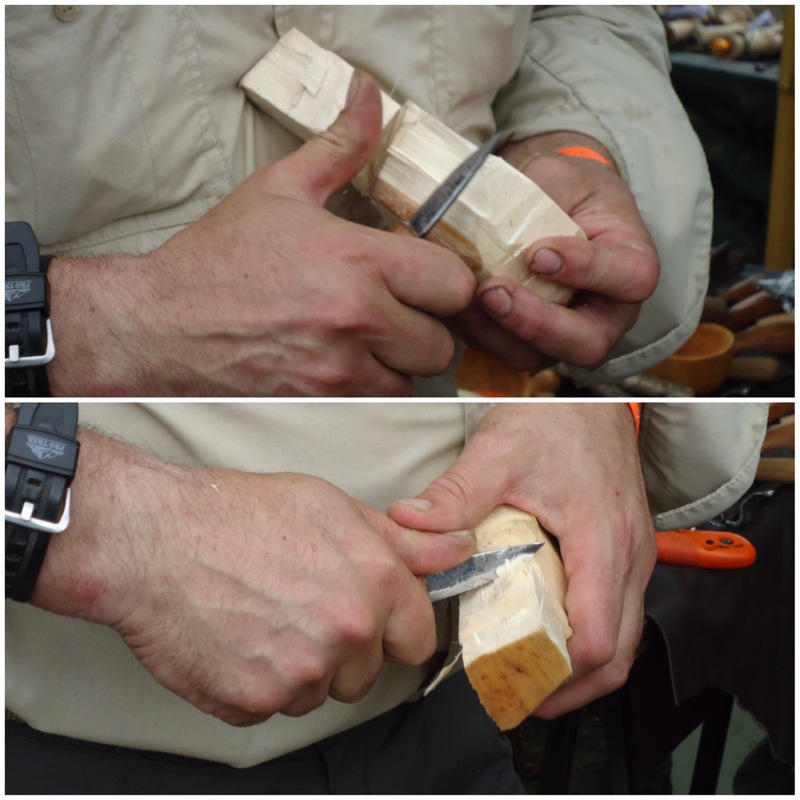 Finally he used a small knife to shape the outside of the kuksa. He used a number of cutting styles cutting towards himself and away from himself but he was always in full control of the knife and soon had the basic shape of the kuksa made. As this was green wood he then explained he would let it dry slowly over a number of weeks before finishing it off. 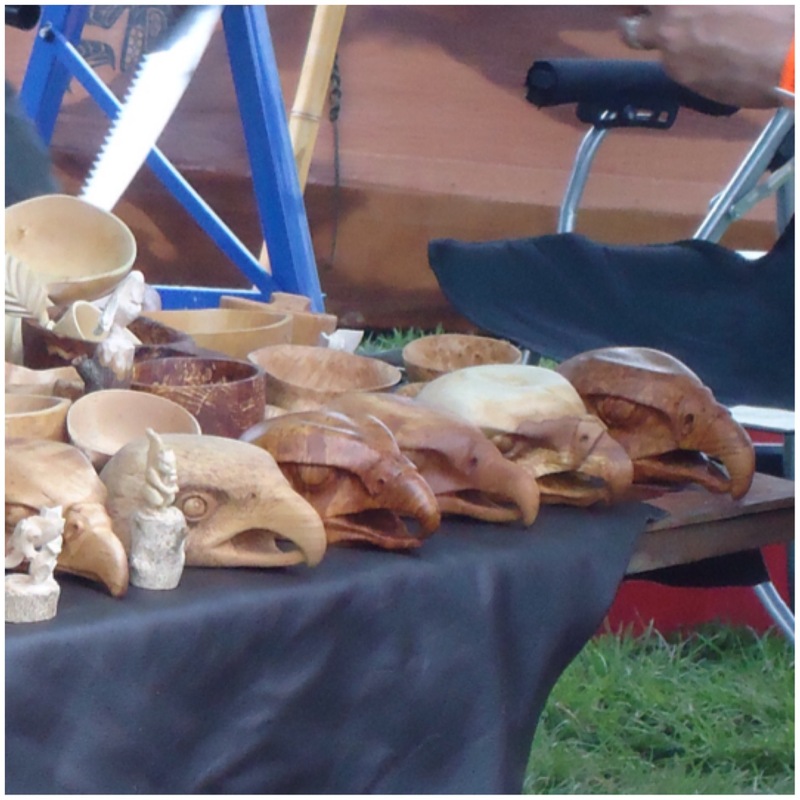 Here are some of John’s finished kuksas on display at the Gathering. 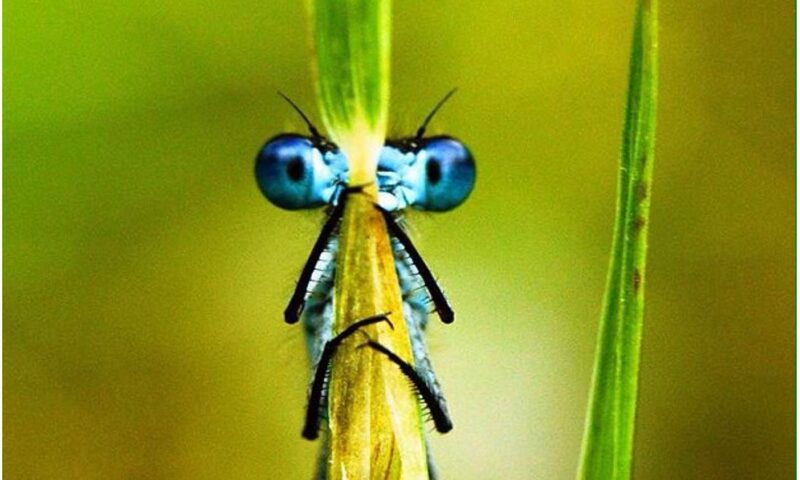 With this level of detail you can see why he is a master craftsman. 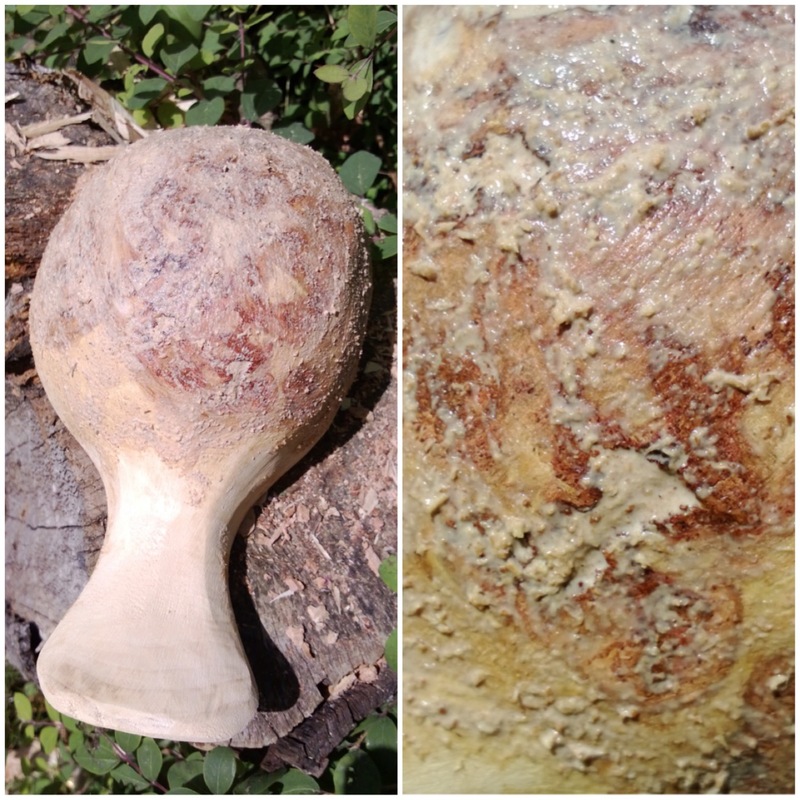 Back to my kuksa – the burl wood of the bowl came out very easily with a chisel and my crook knife. I put lots of stop cuts into the sides of the blank so as to help get rid of the excess here in a controlled way (you can see all the pencil marks where I was to put them). I really took my time here to get rid of the excess wood and not damage the bowl. 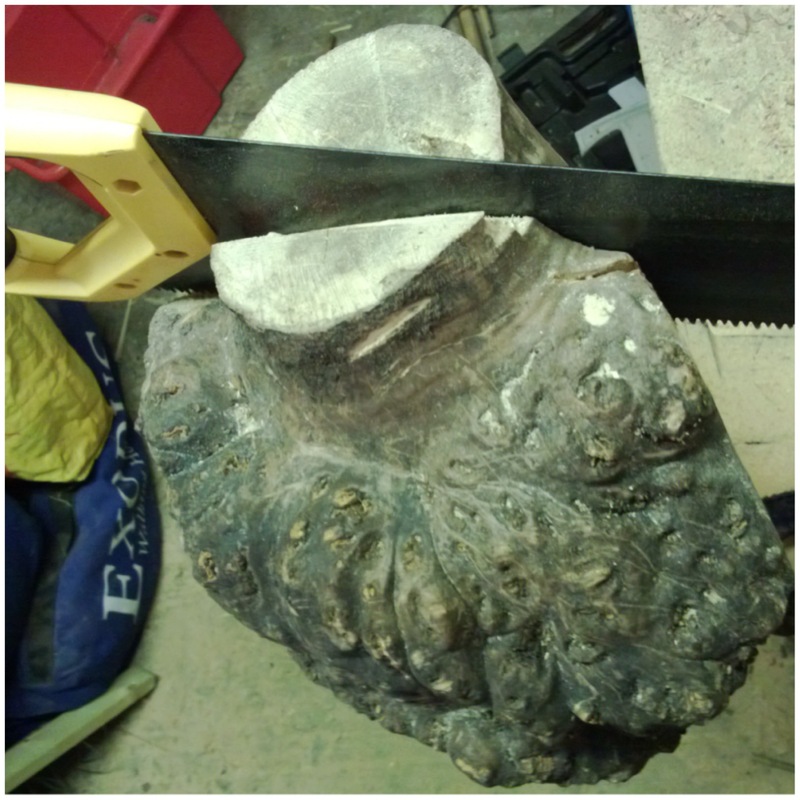 The whole process of removing the burl wood took quite a while as the outer bark was very hard and the burl wood underneath the bark because of its curving nature was very soft in places and very hard in others. 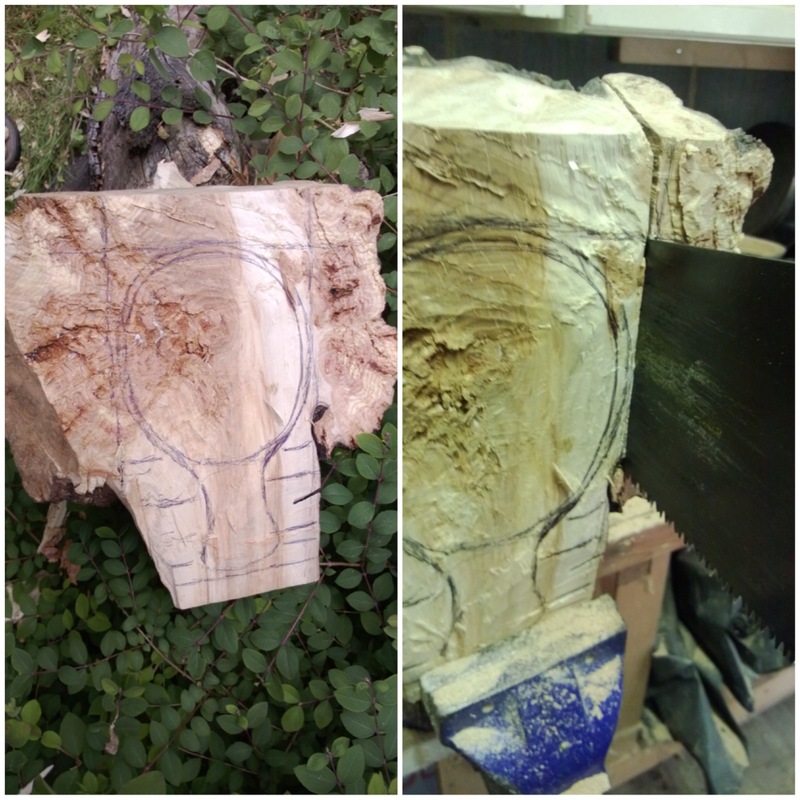 When I had formed it into the shape you see in the top picture (below) I started using different grades of sandpaper, working up from very rough to very fine, until it reached the smoothness you see in the bottom picture. The inside of the bowl was very stable, smooth and did not contain any holes. The underside was a different matter with small holes in a number of places. In the up close pictures below you can see that they were fairly deep. I felt I needed to fill these holes to prevent any leakages (never a good thing when you are desperate for a brew). To fill the holes I used a mixture of wood glue and sawdust from the sanding as a kind of filler. I rubbed the mixture all over the underside of the bowl, allowed it to dry, sanded it and repeated the process again. This all took a couple of days to allow for the drying process. There was still some roughness left over even after the sanding but I felt that went with the character of the kuksa. To seal the cup I melted beeswax and poured it over the cup. 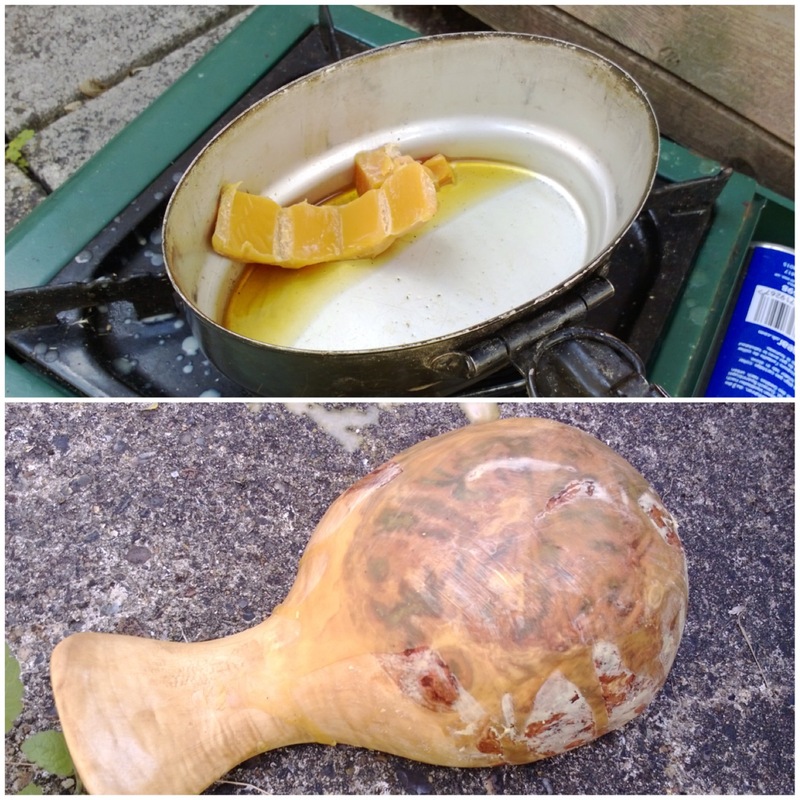 I then re-melted the beeswax with a hairdryer so that as much of it as possible would soak into the burl wood to fill all the pores. 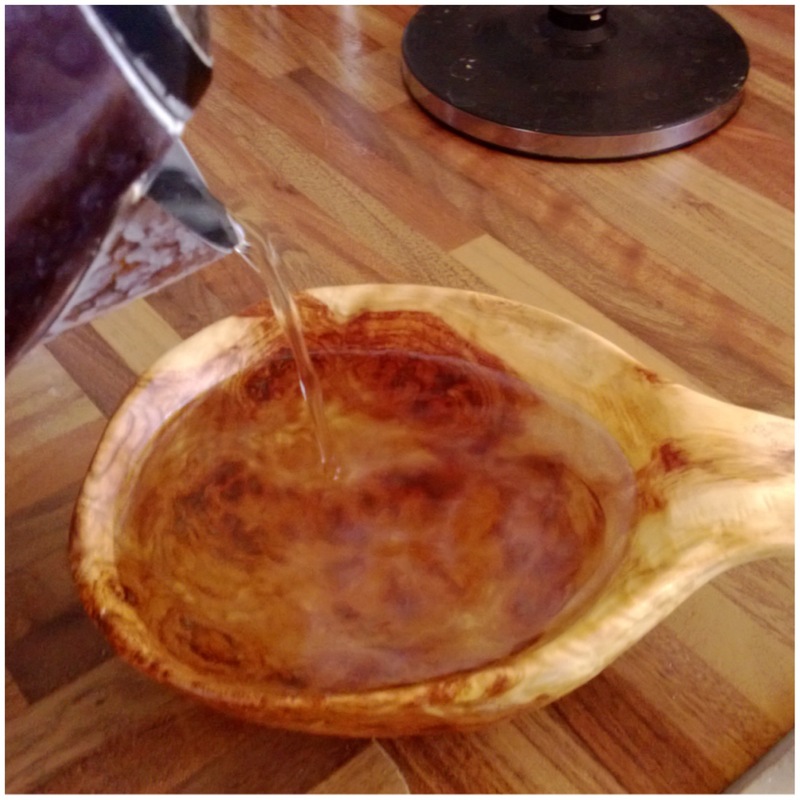 I repeated this a number of times, covering the whole cup until no more beeswax would soak into the wood. The beeswax did what the sanding alone never could; it smoothed out the wood and gave it a lovely shine as well. 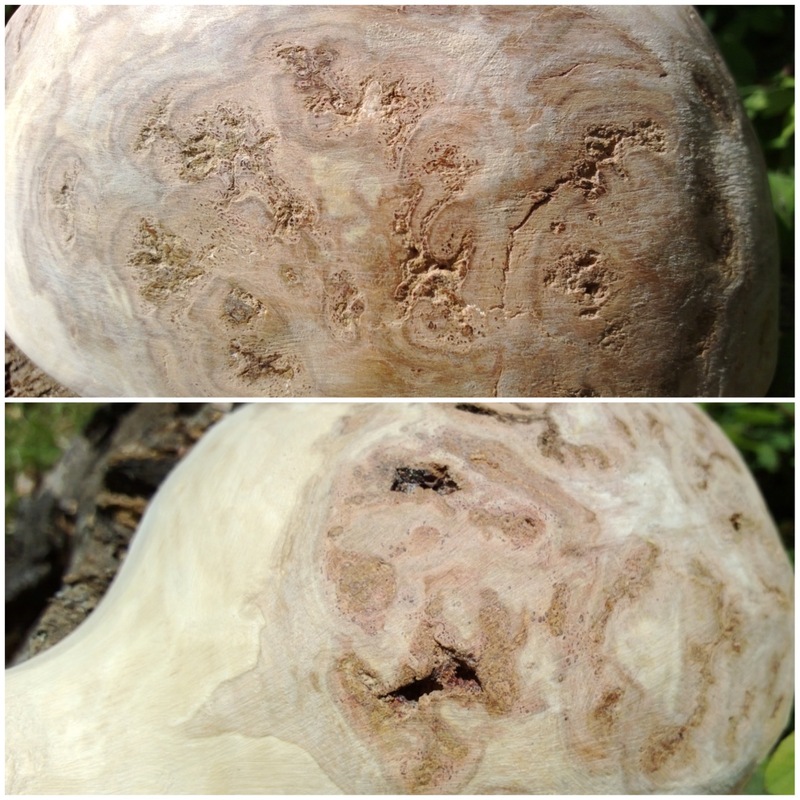 The swirls of the burl wood really stood out after this process. I particularly liked the contrast of the burl wood of the bowl with the heartwood of the handle. This is what I was hoping for and was very pleased with the outcome. Next up was to test out the waterproofness of the cup. To begin with I poured cold water into the cup and let it stand for an hour. Thankfully there were no leaks. Then it was time to add hot water. I started with warm water and in stages moved up until I was pouring just-boiled water into the kuksa. I was fairly happy that there would be no leakages now. Next up was to see how a brew tasted with all that beeswax in the wood. I poured myself a coffee and could taste nothing of the beeswax. I think the boiling water helped with removing any excess beeswax. 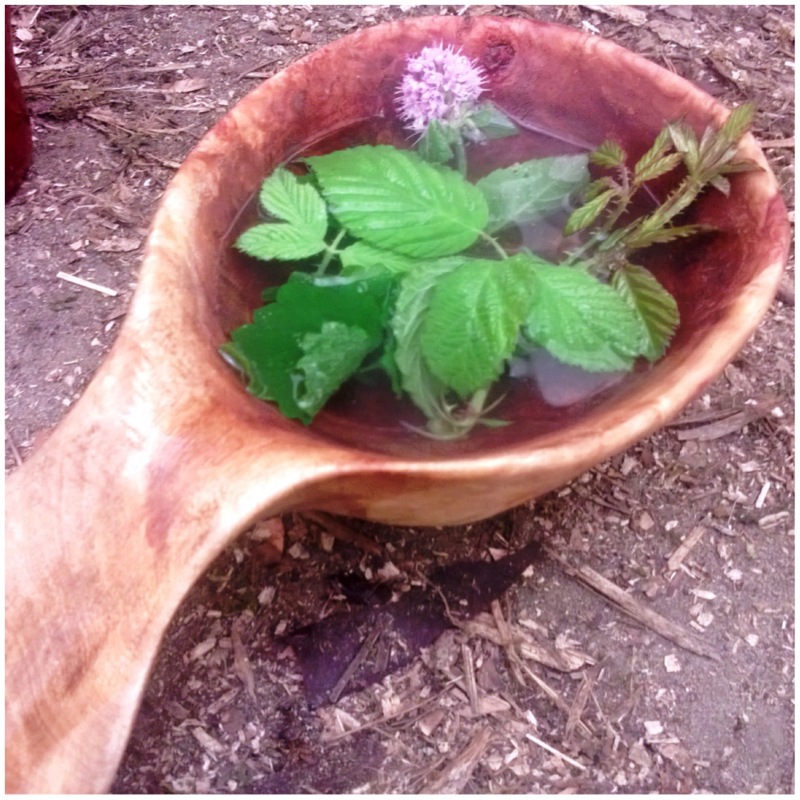 A final test was at my friend Fraser’s place (of Coastal Survival) when he made me a beautiful cup of mint and blackberry tea. 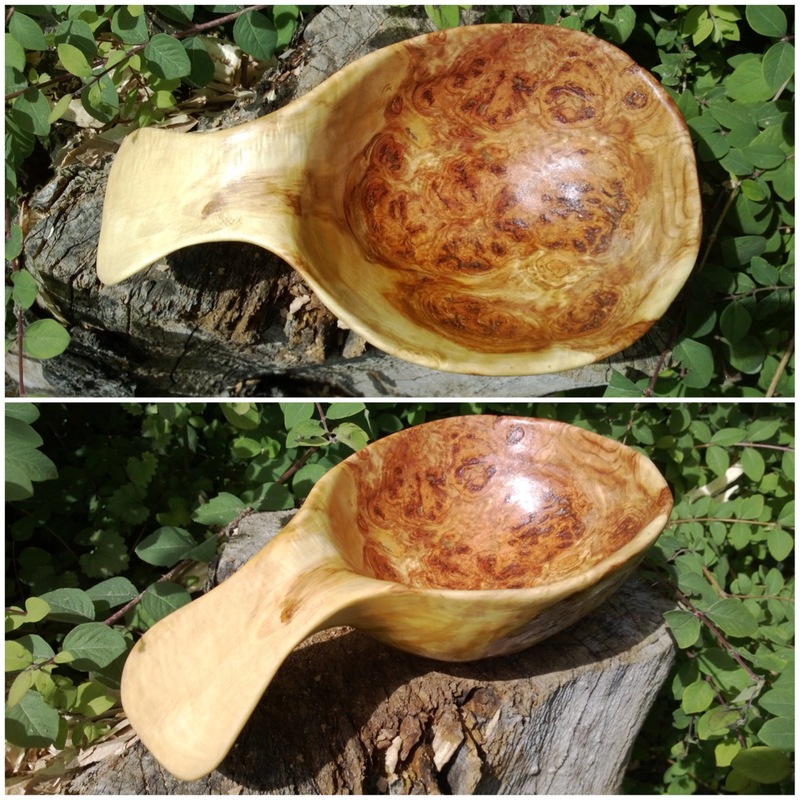 I used more of the burl to make a bowl to go with the cup and it too turned out quite beautifully (in my opinion at least!). George. Very informative and something I would like to attempt. Well put over. Jim. Happy to teach you it if we ever get our act together on a bushie weekend. That’s a fantastic looking piece of work. Well done, thanks for sharing!